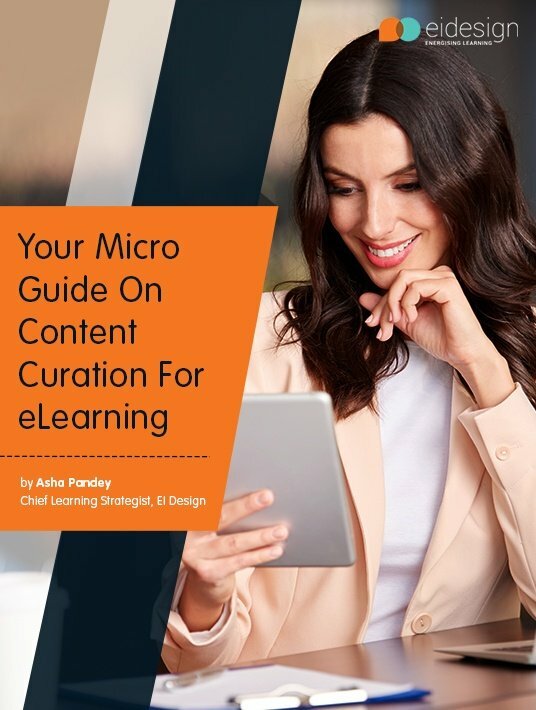 This eBook is designed as a micro guide on Content Curation and provides insights on its definition, benefits, and more specifically, how it can be integrated into your learning strategy. It shows how the right integration of Content Curation for eLearning can help you accrue significant benefits and add the required edge to your existing learning strategy. This section begins with the definition of Content Curation and then outlines the key benefits it offers. It also provides insights on how usage of Content Curation will enhance your existing learning strategy. This section looks at the related facets such as what is the true value of Content Curation and if it can support the 70/20/10 model of learning. Using this as the backdrop, it outlines why it makes business sense to adopt Content Curation. This section details out the steps involved in Content Curation. It additionally shows the positive impact it creates on your existing approach. Additionally, it outlines the positive impact this creates for the L&D Teams. This section moves to the “how to” aspects and outlines the tips and best practices that you can use as you begin integrating Content Curation in your organization. The focus is on facilitating its adoption and helping you multiply its impact. The last section provides a Case Study that can help you understand how you can potentially use Content Curation in your organization. Content Curation provides an option to support formal training and more significantly contribute in providing tools for Performance Support. It is an effective approach to promote Informal learning in the workplace. New to Content Curation and feel there is a lot that you are missing out on it? Lucky for you, El Design has foreseen such a need and went on with composing and publishing this most useful micro guide. Make a start with definition and key benefits, then dive into the secrets of Content Curation. Read about steps you must take, get tips and best practices for effective integration. Ideally closing with a case study, this guide will leave you having a complete idea of what your organization will look like after receiving the positive impact of Content Curation.